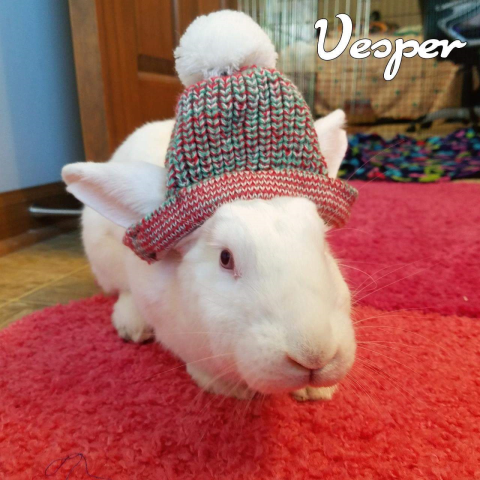 Vesper is available for adoption! Vesper's ears are all better now. She's quickly learned how to be a house rabbit! Vesper is very tidy, great with her litterbox, and is curious about the good stuff that people bring. She seems friendly and fun, we hope she finds a great family! From Vesper's foster family: While she was shy for the first few days she warmed up quickly. It wasn't long before she was following me everywhere and begging for pets. She loves playing with toys, enjoys ripping some cardboard, has great litter box habits, and while she steps in her water now and then she doesn't pick her pen apart. Oh, and she's a CUTE sleeper. She even flopped and fell asleep during our photo shoot! She is patient and doesn't mind being picked up. She's also available for adoption (though I'm secretly hoping this cuddle bun stays with me a bit longer)!